Woodsia obtusa (Swartz ) Torr. Culms: Erect to horizontal, short-creeping, petiole bases of unequal lengths persisting; scales brown, some with darker central stripe and paler margins, lanceolate. Leaves: Petiole straw-colored, 1.2 to 6.8 inches long; rachis green, glandular hairy; blades bipinnate to bipinnate-pinnatifid, lanceolate to ovate in outline, 3 to 20 inches long, 1 to 5 inches wide; pinnae nearly opposite, up to 20 pairs, proximal pinnae somewhat reduced, short petiolate, upper mostly sessile, ovate-deltate to ovate-lanceolate, .6 to 2.5 inches long, .4 to 1.2 inch wide; ultimate segments obtusely lobed, base usually equilateral, apex tapered to rounded or acute, surfaces glandular hairy; pinnules in 5-14 pairs, oval, elliptic or oblong, margins thin, dentate, sometimes deeply lobed; sori brownish, nearly round, borne on underside of fertile pinnules in 1 row between midrib and margin; indusium attached beneath the sori, cuplike, splitting at maturity into 4-6 segments; spores brownish. 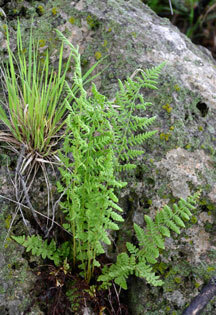 Habitat: Moist or dry, rocky wooded slopes; usually on rocks.